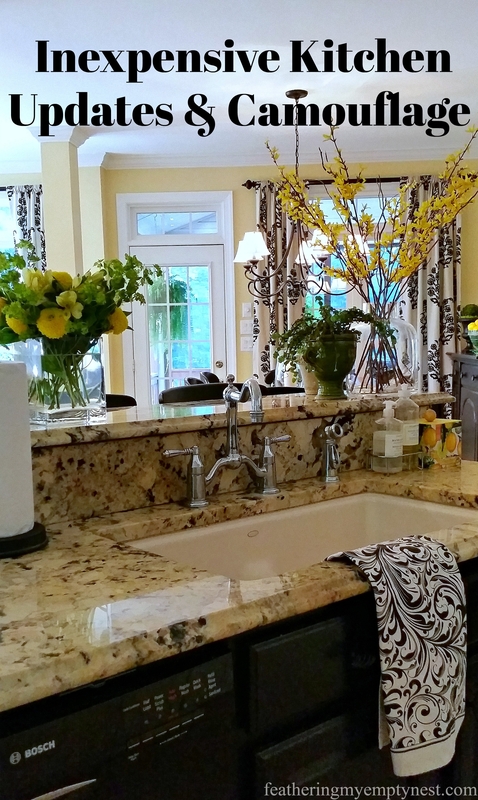 When I think of the 4th Of July, visions of sunny picnics, cookouts, and pool parties come to mind. But what do we do if it rains on our parade? 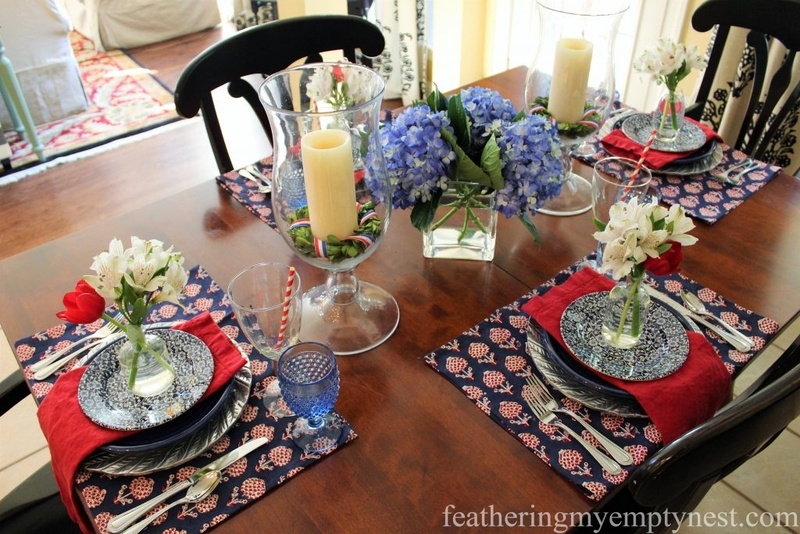 One year, when faced with a weather forecast of an all-day deluge, I was determined to figure out a way to get my red, white, and blue on indoors. Instead of the hamburgers and hot dogs I’d planned to cook on the grill for lunch, I decided to start the soggy day off on the right foot with a patriotic brunch. 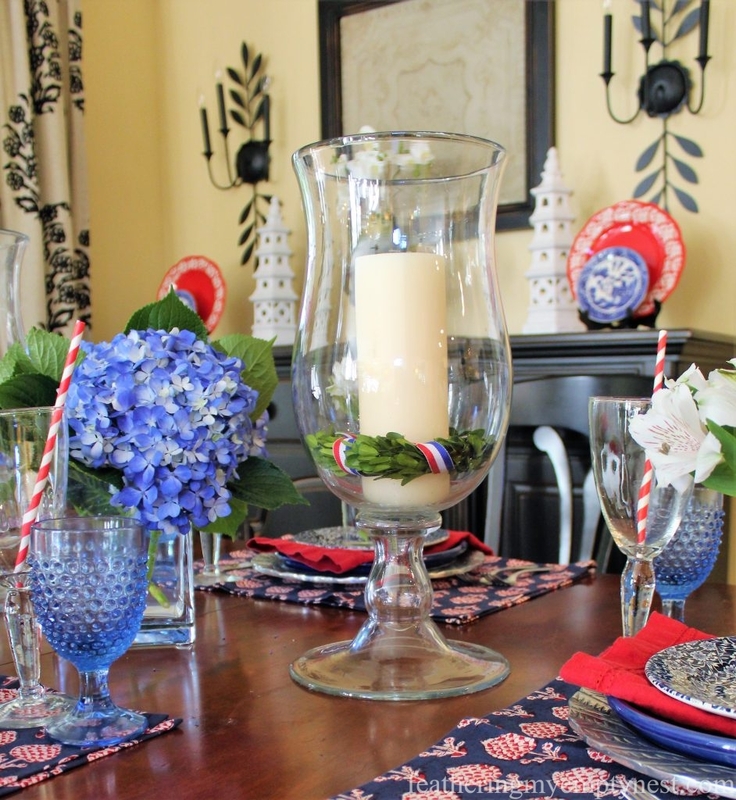 After running out to the grocery store to pick up a few ingredients and some flowers, I returned home to try to create a festive 4th Of July table in my kitchen. 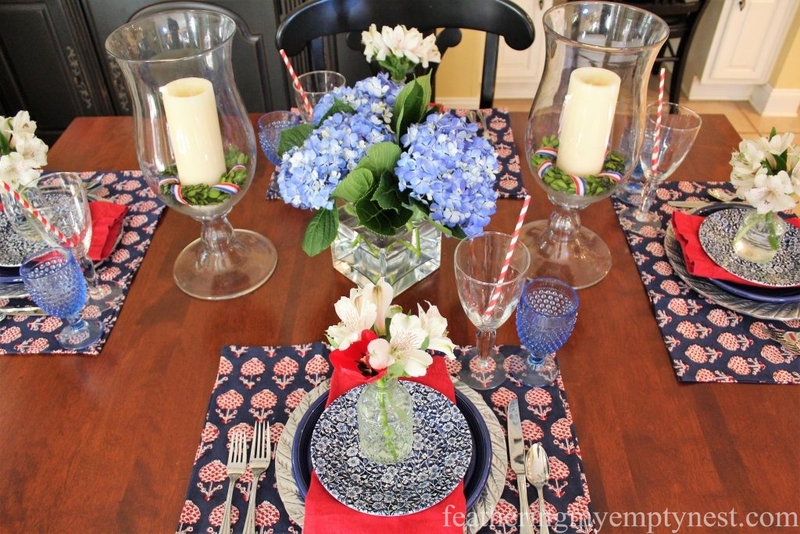 As I mentioned in last year’s post on the fourth, I do not have a red, white, and blue tablecloth. However, I did find some navy and red floral tea towels which I bought thinking I’d use them as napkins. In this case, I just folded them in half, and they became perfect patriotic placemats. 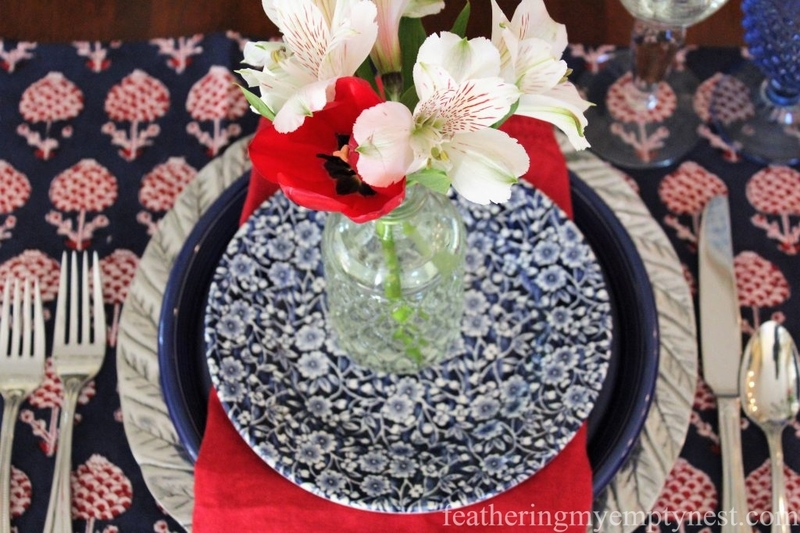 Next, I added pewter chargers, dark blue dinner plates, red linen napkins, and calico salad plates to continue the American color scheme. 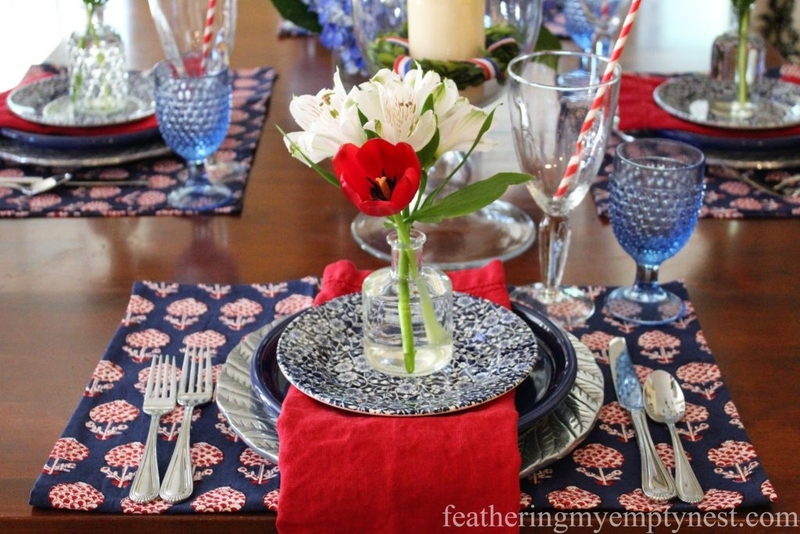 Stainless flatware, blue hobnail juice glasses and large water goblets with red and white paper straws rounded out the place setting. 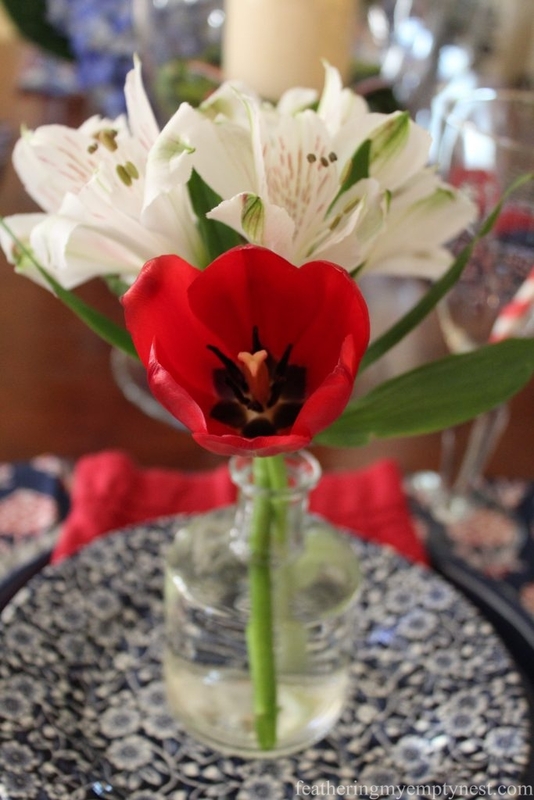 My plan was to use flowers from my yard on my 4th Of July table, but as it was pouring down rain, I had to settle for the flowers that were available in the grocery store. 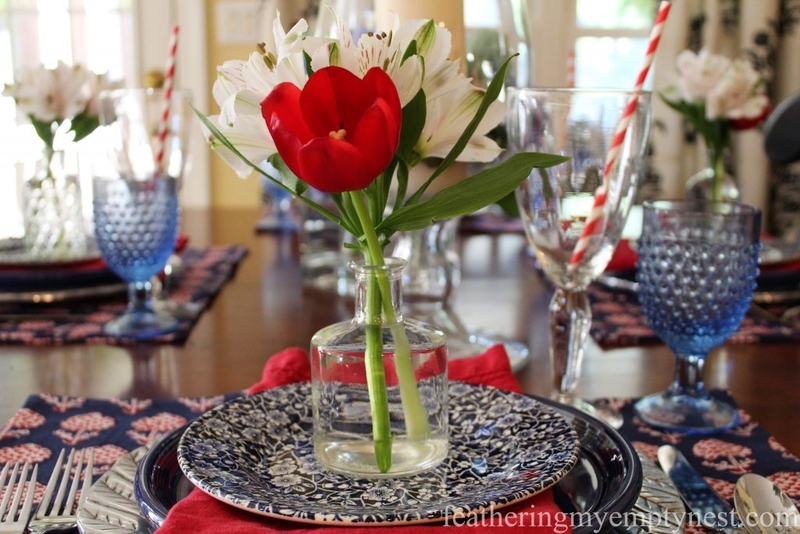 I bought white alstroemeria and red tulips to fill the bud vases I placed on each plate. 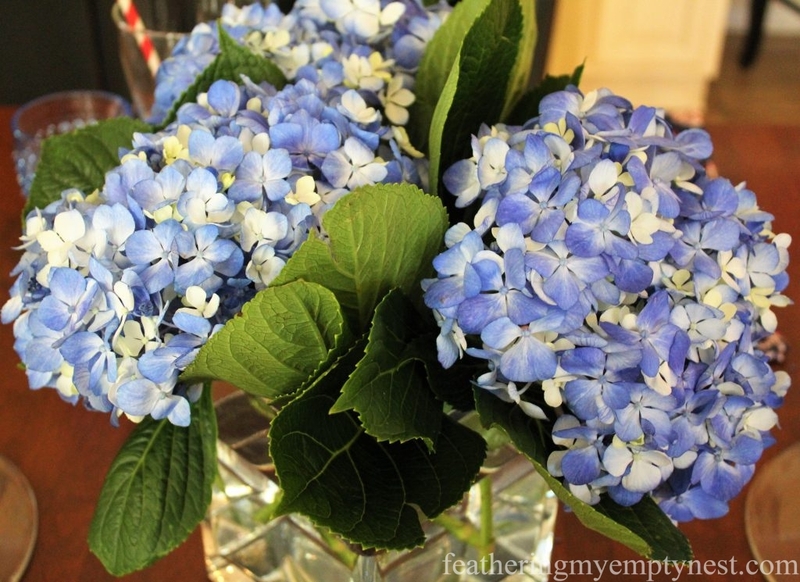 And a bunch of blue hydrangeas in a glass cube made a simple but vibrant centerpiece. Small preserved boxwood wreaths wrapped in red, white, and blue ribbon served to give some patriotic flair to the hurricanes that always sit on my breakfast table. 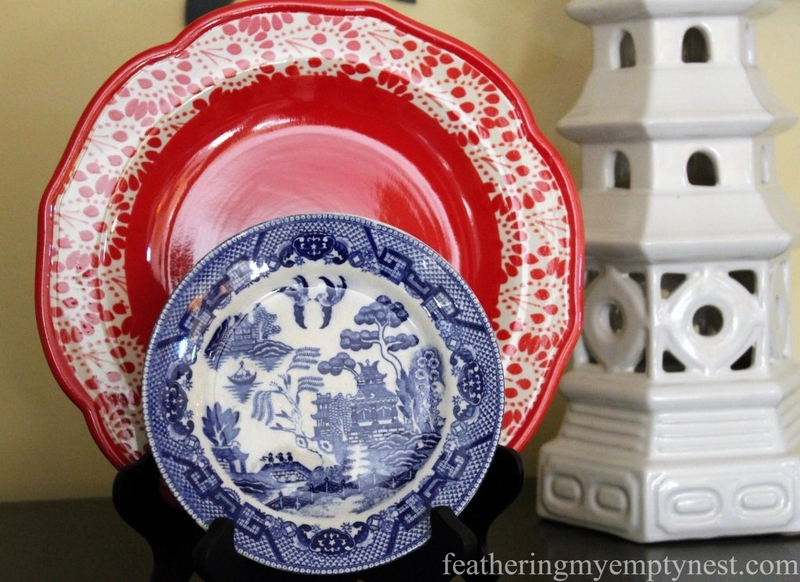 I also grabbed some additional red and blue plates to display on the buffet. 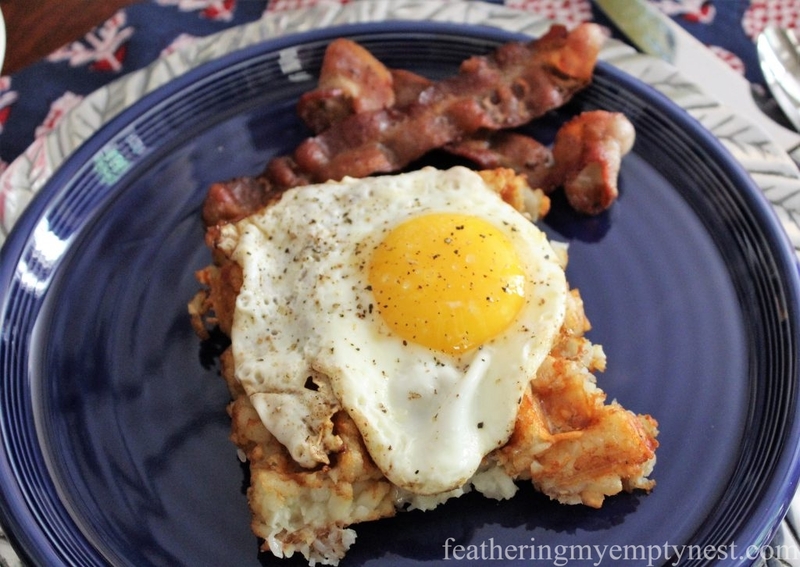 For my rainy 4th of July brunch menu, I made an all-American meal of eggs, bacon, and hash-browns with a twist. The twist was in the form of a hash-brown waffle, made by squishing a bunch of thawed frozen tater tots together in the waffle iron and cooking them for about 8 minutes. I served a fried egg on top of the potato waffle, but sour cream and applesauce would also be delicious. Fresh strawberries and blueberries served over vanilla yogurt made an appropriately patriotic side dish. As empty-nesters, with no little kids to entertain, we decided to spend the damp day binge-watching movies or shows about or relating to the Revolutionary War. The following is a selection of movies and series you can stream for your Independence Day Film Fest. If you have kids, you could try screening this old Disney production based on the 1944 Newbery Medal-winning children’s’ book Johnny Tremain. For dinner, since the brunch was fairly substantial, we had a light no-fuss indoor picnic of cheese and crackers, hummus and pita bread, grapes, and wine which we ate on a blanket on the floor in front of the TV. In the evening we got our fireworks fix on TV. If your local fireworks are rained out, you can watch a concert and fireworks on a Capitol Fourth on PBS at 8 p.m. ET or Macy’s 4th Of July Fireworks Spectacular on NBC at 8 p.m. ET. Wishing you a happy 4th whether you have rain or shine! Well, the rain has been here every day lately. So here’s hoping for this 4th. But will try your ideas if hopes don’t work. Loved “Turn” maybe watch it again. Thanks so much for taking the time to comment. I agree with you about “Turn.” It was really well done and quite compelling–well worth binging on. I was especially fascinated by Burn Gorman’s performance as Major Hewlett. I hope the sun shines on your 4th! 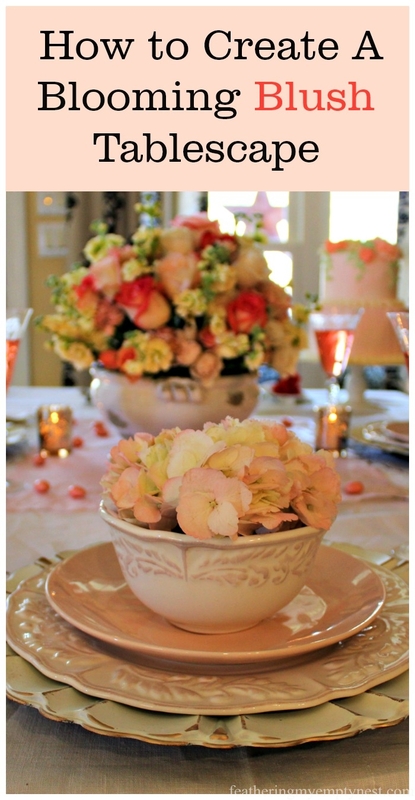 Oh what a pretty tablescape. 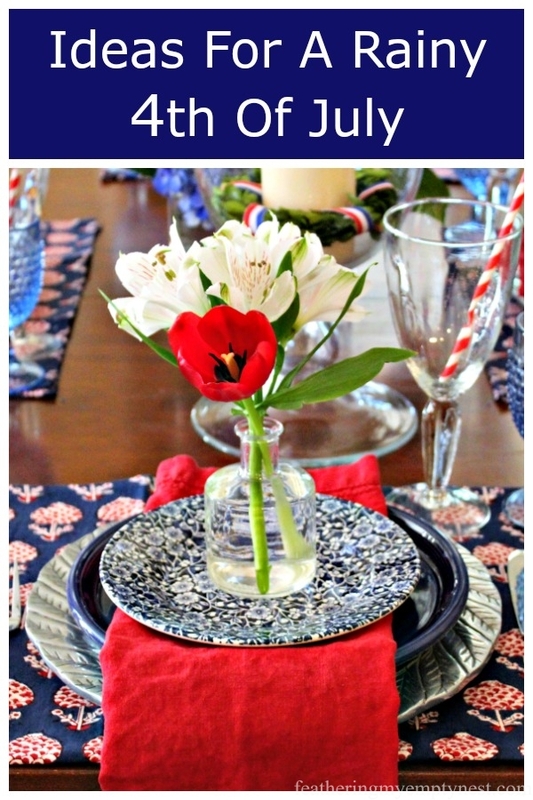 Lovely TABLE arrangements, and great ideas! Thanks so much for your comment. Hope you have a happy 4th!